UPDATE: The sample applications are no longer available on the NIGMS website. As described in an earlier post, NIGMS supports several kinds of individual predoctoral fellowships for advanced Ph.D. or M.D-Ph.D. students. To assist trainees in developing their applications, several investigators have graciously agreed to let us share their successful predoctoral F31 applications on our Web site. Some parts of these applications have been redacted to protect personal and other private information. Please note that the investigators provided these applications for nonprofit educational uses only. The applications may not be changed, and the investigator and grantee institution should be credited as the source of this material. As we fund additional fellowships, we may post more samples for educational use. For additional information about our F30 and F31 programs, please refer to the NIGMS NRSA Individual Predoctoral Fellowships Web page or contact fellowship coordinator Peggy Schnoor. I hope you find these sample fellowship applications useful, and I welcome your suggestions about other training tools or resources we can offer. 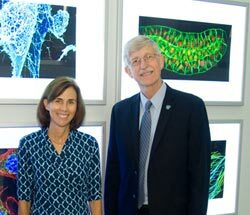 NIH Director Francis Collins with NIH scientist and ASCB President Jennifer Lippincott-Schwartz at the Life: Magnified exhibit. Credit: Charles Votaw Photography. Yesterday, I was thrilled to walk through Life: Magnified, a newly installed exhibit of stunning microscopy images at Washington Dulles International Airport. The pictures lit up the 2-story gallery space with vibrant colors, intriguing shapes and incredible science. The exhibit, which we co-organized with the American Society for Cell Biology (ASCB) and the Metropolitan Washington Airports Authority, runs through the end of November in the walkway leading to Concourse C.
This striking image collection has already been featured in a number of major news outlets, including Science , NBC News online , The Atlantic , The Washington Post and National Geographic . What a great way to share the complexity and beauty of biomedical science with such a large public audience! We had a tough time selecting the 46 images in the exhibit from the more than 600 submitted by the scientific community in response to calls from us and ASCB . The images, which are from labs in 17 states—from Massachusetts to Missouri to Montana, represent work funded by NIGMS and nine other NIH institutes. The collection showcases the rich diversity and activity of life at the cellular level: ever-changing architectures, communities cooperating and colliding, a daily struggle between health and disease. It includes various tissues—skin, bone, muscle, fat, blood, brain, liver, eye, ear. It presents examples of normal development as well as diseases. And it includes pathogens that infect us—anthrax, HIV, Ebola, rotavirus, bubonic plague. Quite a few of the images come from model organisms, providing us an opportunity to convey to non-scientists the important role these systems play in helping to advance understanding of human health and disease. The exhibit also features a range of cell imaging and microscopy techniques. This project is an excellent example of a public-private collaboration to bring biomedical science to a public place where a wide array of people will be able to see, enjoy, marvel and learn from it. We hope to have more opportunities to do this in the future. While Life: Magnified is best viewed in person, if your travels don’t take you through Dulles as a ticketed passenger, you can still see the images in our online gallery. This site includes longer captions than in the airport exhibit and enables anyone to freely download high-resolution versions of the images for educational, news media or research purposes. If this exhibit inspires you to share the beauty of your own work with the public, we’re always interested in receiving new content for our image and video gallery. Send your submissions to Alisa Zapp Machalek. Not only does she manage the gallery, Alisa was the NIGMS project leader for Life: Magnified and worked tirelessly with colleagues in NIGMS and the collaborating organizations to mount the show in record time. UPDATE: Due to the positive feedback it has received from travelers, the “Life: Magnified” exhibit remained on display at Washington Dulles International Airport through January 21, 2015. The online gallery of the images will be available indefinitely. NIGMS plays a major role in supporting research training, career development, diversity and capacity-building activities that foster a strong and diverse research workforce. The Institute’s Division of Training, Workforce Development, and Diversity (TWD) coordinates these efforts. TWD also serves as a focal point for similar activities across NIH and among other federal and non-federal agencies and organizations. The search is now open for an outstanding individual to serve as director of the TWD Division. This position offers important and unique opportunities to set new directions and shape new strategies, including optimizing training models to best address scientific and workforce needs. Candidates must have an M.D., Ph.D. or equivalent degree in a field relevant to the position. The ideal candidate will have a broad spectrum of scientific knowledge in fields related to the NIGMS mission and considerable experience in research, research training and activities aimed at developing a diverse biomedical and behavioral research workforce. Beyond that, we’re looking for someone who has vision, is innovative, and has exceptional leadership, management, strategic and collaborative skills; experience leading change; and an interest in testing ideas and approaches experimentally. For additional information and application instructions, please see the vacancy announcement (no longer available). Applications will be accepted from June 1, 2014, to July 15, 2014. As chair of the search committee for the division’s director, I ask for your help in identifying candidates for this crucial position and in sharing this information with others who might be interested. UPDATE: This vacancy listing has been extended to August 31, 2014.